Open Keychain Access. Select the Passwords category and you will see a list of sites where your login password has been cached for various sites. You can delete the unwanted entries simply by highlighting and pressing the delete key. Note: You will be asked if you are sure you want to delete “the item” from the login keychain. Items such as your wireless (Eduroam) password can also be deleted. Navigate to Preferences > Passwords. If you have saved any passwords, you can choose to remove selected passwords or all passwords. Navigate to Preferences > Security > Saved Passwords. If you have chosen to have “passwords remembered for sites,” they will be located here. Passwords can be deleted for a particular site or all passwords can be removed. Navigate to Preferences > Settings and then choose Show advanced settings at the bottom. 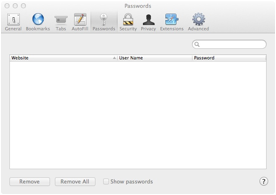 Next, under Passwords and forms, click on the Manage passwords link. Under the Saved passwords section, select the website and click Delete button.